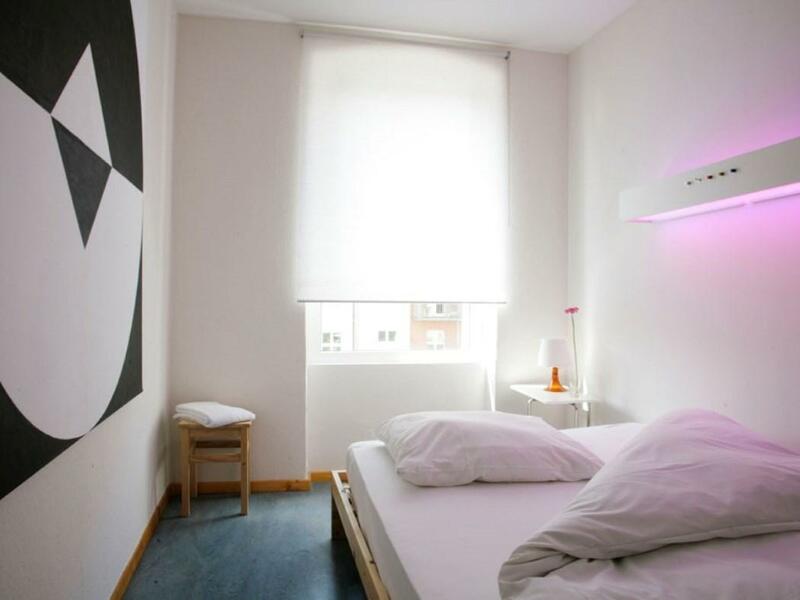 This hostel enjoys a youthful, relaxed atmosphere and a central location in Berlin's trendy district of Prenzlauer Berg, close to many popular bars, cafes and restaurants. The stylish single, double and triple rooms of the Old Town Hostel are all private, there are no dormitories. All rooms feature a changing lighting scheme which guests can set to their own taste. The Old Town Hostel also offers free internet access in the rooms and common areas as well as an in-house library. The lobby's kitchenette is available for guests to make small meals, while many cafes are located near the property. The Old Town Hostel is close to the Eberwalder Straße U2 underground station and 3 different tram lines, and provides easy access to all cultural and historic attractions in Berlin city center. Please note that the hostel does not have a 24-hour reception. In the interest of noise prevention, please note that Old Town Hostel may not be booked for parties. Please note that guests wishing to bring a car will require an Umweltplakette (fuel emission sticker) to enter central Berlin. This must be purchased in advance. Everything is good. The exception is the reception is not open 24 hours, when we had to leave in early morning. We couldn't leave our luggages in the luggage room. We left them in our room and had to come back before checking out time for moving them out of the room. this is one star....no tv..one towel for 4 days...no cleaning...cold old building with lino floors...noisy floors....thin walls, could hear the person in next room breathing...no lift...no bar....no restaurant. Lots of room, easy/reliable wifi, clean, friendly staff, great location for my purposes. I'd come back to this hostel (more like a pensione / small hotel) again! Staff were friendly and very helpful. The neighbourhood is relatively quiet and very interesting. The streetcar was just outside the door, linking to a practical and inexpensive transit system. Propre, calme, bien situé, personnel très sympathique. Court séjour de 4 jours 3 nuits. Hotel bien, calme malgrès la faible épaisseur des cloisons. Alles bestens, nur zu empfehlen! מיקום טוב, קרוב למרכז העיר (תחנות אחדות ברכבת), חדרים לא קטנים מידי ויפים, מיתות נוחות, שירות טוב, תמיד שמחו לעזור לנו. בנוסף באכסניה יש פינה חמודה עם מחשב, טלויזיה, ספות ושולחן כדורגל והכל בחינם. הקבלה פתוחה מ-8 בבוקר עד 10 בלילה, כלומר אם ישנה בעיה במהלך הלילה - אין עם מי לדבר. 旅館位置鄰近兩個地鐵站和一個電車站, 步行至地鐵站約10~15分鐘, 電車站只需要30秒; 旅館鄰近超多美食, 大約都該到很晚; 旅館工作人員很優秀, 因為我是半夜check in的, 所以可提前透過mail索取旅館大門PW的.